Products commonly used as feed ingredients that are derived from unused parts of other animals, for example meat and bone meal, feather meal and/or manure, eggs and hatchery waste. Feeding animal by-products is prohibited under A Greener World’s Animal Welfare Approved standards. Animal by-products are the parts of a slaughtered animal that are not directly consumed by humans. This includes fat, bones and gelatin. The vast majority of this material is ‘rendered’ or processed to produce a ground meal called meat and bone meal, which is used in the formulation of animal feed to improve protein levels. However, Animal Welfare Approved standards prohibit any feeding of animal by-products to livestock because of the potential health risks to both humans and animals. Scientists have linked a number of major animal disease outbreaks to the feeding of animal by-products to farm animals. The most notorious example is BSE – and the related human disease CJD – which resulted from the feeding of meat and bone meal back to cattle. Other examples include cases of swine fever and foot and mouth disease linked to feeding infected meat products. There is also the risk of transmission of bacteria, such as salmonella, that may be harmful to human health. Animal Welfare Approved (AWA) recognizes that monogastrics such as pigs and chickens are omnivorous and would often eat insects and worms in the wild, as well as scavenging dead animals. 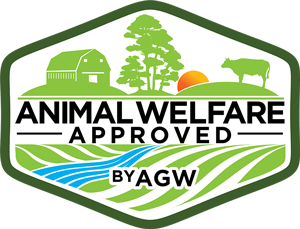 AWA therefore accepts the unintentional but natural consumption of insect or animal products by pigs and poultry while out on the range. However, the human and animal health risks associated with feeding by-products from slaughter to animals are very well documented, and we cannot therefore allow their use in feed. Fishmeal is also commonly used in the formulation of livestock feed for both agriculture and aquaculture. Although fishmeal is not a by-product from slaughter animals, its growing use in animal feed presents problems from an environmental perspective. Most fishmeal is not produced as a by-product of catching fish for human consumption, and millions of tons of fish – including menhaden and other valuable prey species such as sand eels – are harvested each year for processing into animal feed. Together with a number of key marine conservation bodies, AWA believes that this practice is not sustainable and is potentially damaging to the marine environment, and we therefore do not wish to encourage the continued use of fishmeal in animal feeds. Aside from the disease and environmental risks of feeding animal by-products, a growing number of consumers no longer want to buy and eat meat from animals that have been fed these products. Consumers are quite rightly becoming more concerned about the food they eat and the implications of the production methods used – including what the animals have been fed. Farmers do not have to feed fishmeal or animal by-products to their animals in order to ensure that their nutritional needs are met. Ruminants such as cattle and sheep would never naturally eat such feeds. And although the protein requirement of pigs and poultry is different, farmers can easily include synthetic amino acids to balance the ration if vegetable proteins are not sufficient. In summary, AWA sees no benefit in the use of animal by-products or protein in livestock feeds. In fact, AWA can see many potential risks from their continued use and has therefore decided not to allow them on AWA-approved farms.